Who for? Those who fancy themselves as the next Top Gear presenter! This is an exciting new concept, ideal for those with a passion for driving and a thirst for adventure! Imagine yourself and a few friends crossing the raw and rugged Icelandic terrain by the ultimate means – at the wheel of your own Icelandic superjeep. 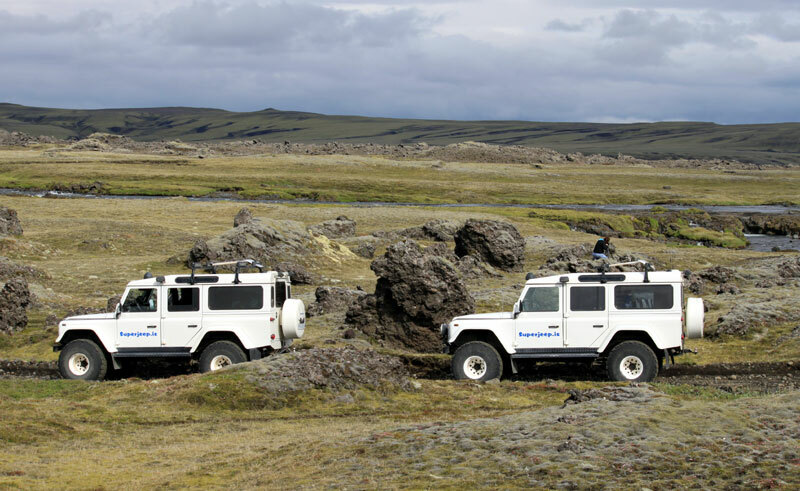 The perfect adventure for small private groups, these powerful, heavy-duty vehicles are made for exploring. Please note that our iDiscover service is not available with ISAK Superjeep hire. The diverse landscape of this extraordinary island begs to be discovered and there are many challenging parts where only a superjeep will suffice! The instant adrenaline rush and sense of achievement in having handled a superjeep over such terrain is unbeatable! Drive remote tracks where no other vehicle can reach, cross rivers or pick your way through snow covered highlands – this is the ultimate driving experience. Although we offer rental for a minimum of one day, we feel sure you’ll want to keep the keys for longer, as driving such a sturdy vehicle, with an elevated suspension and the power to propel huge tyres almost anywhere, is highly addictive! With a full mandatory run-down on how to handle this beast of a vehicle (HQ is in Reykjavik), you’ll be equipped with the right information to confidently and safely explore the wilds of Iceland. All vehicles are easy to drive and react really smoothly whatever the condition. The Icelandic Search and Rescue Team use some of these robust machines – what better proof of their capabilities! The model of choice for these trips is the long wheel base version of the Land Rover Discovery 110, which seat up to 7. The engines are diesel, they have onboard GPS, VHF radios for car to car communication, and all the modifications required for a safe, secure and surprisingly comfortable assault on all manner of terrain. And of course they are fitted with the superjeep trade mark – oversized tyres – 38 inches to be precise! Part of the driving technique on some of the more gnarly lava tracks and over snow and ice, is to reduce tyre pressures so the vehicle effectively ‘floats’ over the surface. Then, once back on more stable ground the tyres are re-inflated using the onboard compressor – not a cigarette lighter, Jeremy Clarkson take note! Should you wish, you can opt to be accompanied by a certified guide who will regale stories and share fascinating facts about the country, its nature and culture. Stay either in rural mountain huts, bathing in natural and remote hot springs, or let us book comfortable hotel accommodation for you. If you’d prefer a home-from-home experience, we can arrange overnight stays in summerhouses and cottages that are perfect for groups of friends or a large family. They are all well-equipped and thoughtfully appointed, most with their own outdoor hot tubs; ideal for a steaming soak at the end of an active day. Iceland’s interior has to be seen to be believed; drive amongst colourful rhyolite mountains, tumbling glaciers and ice sheets, surging rivers and vast lava fields. Imagine exploring this other-worldly landscape by superjeep, seeing immense powerful waterfalls, spouting geysers and venturing where other vehicles fear to tread! Note: it is illegal to drive off-track in Iceland as it’s important to protect this stunning landscape but there are plenty of challenging tracks to keep you entertained! Talk to our team about your driving experience, your group’s needs and the finer details of what’s on your holiday wish list, and in combination with the expert knowledge of our superjeep partners in Iceland, we will tailor an Icelandic adventure specifically for you. Note the ground handler operating these superjeep disclaims responsibility for any loss, damage, accident, sickness or schedule change caused by weather, strike or any other irregularity outside their control. If guided they reserves the right to alter routes, itineraries or departure times, without prior notice, should the necessity arise.